Not for the first time this season, Bedford’s mistakes cost them dearly as top four-hunting Ealing Trailfinders picked up a 29-16 victory at Goldington Road on Saturday. 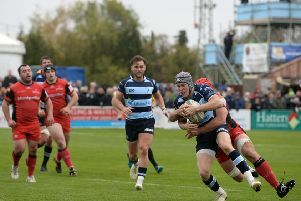 It was the fourth meeting between the sides this season and Ealing continued to pounce on Blues errors. Bedford managed a couple of cracking tries through Piers O’Conor and Elliot Clements-Hill, but Mark Bright and Mile Mantella scored for the visitors while Aaron Penberthy hit 19 points from his boot. It was a stop-start first-half with both teams going in hard but coming away with nasty knocks. The first saw Luke Daniels slip as Ealing attacked and took a hit on the knee. Penberthy got the scoreboard rolling with a penalty soon after. The Blues were forced into an early change when prop Billy Walker injured an arm, with Myles Dorrian slotting over a penalty to level. Back came Ealing and another Blues infringement led to the reliable Penberthy kicking the visitors back in front. There were a nervous few seconds for Clements-Hill when he clattered into a mid-flight Mantella, but the referee decided it was nothing more than a penalty and Ealing kicked to touch. The visitors made good use of the lineout maul, but Bedford stopped it well. A midfield Blues scrum led to the opening try as the ball was hooked back with Tom Whiteley finding Dorrian who sent a long pass to O’Conor. He made good ground before offloading to Howard Packman who charged down the right before drawing the defender and playing in O’Conor for the unconverted try on the half-hour mark. The restart led to Ealing’s first try as the ball was taken into the Blues 22 and kicked out on the full. A penalty followed and the ball went to touch before the visitors went through the phases and Bright crashed over from close, Penberthy converting for 13-8. Penberthy extended the lead with a 40th minute penalty but that was cancelled out by Dorrian on the stroke of half-time after Aled Jenkins was carded for a deliberate knock on. Bedford made the most of the numerical advantage as they scored their second try in the 44th minute. A break from Tom Whitely saw him linking with Jordan Onojaife who showed excellent handling skills to find his second row partner Will Carrick-Smith. The lock charged on before feeding Packman who made full use of the slope to draw the defence and offload to the waiting Clements-Hill who dotted down to level the score. The Blues had chances but squandered them. At one point they went through 14 phases in the Ealing 22 only for the ball to slip the grasp. Penberthy put the visitors back ahead with a 67th minute penalty. Bedford continued to push but an error gifted Trailfinders their second try. Having pinned the Blues back and pressuring the ruck, a loose pass didn’t find the intended recipient and Mantella collected for a converted try. Bedford went in search of more, but the visitors soaked up the pressure. The Blues travel to Nottingham this Sunday.